Unfortunately due to several weeks of warm weather leading to a lack of snow the official Jiserska 50 Worldloppet race was cancelled. However in its place to honour the memory of the 14 Czech mountaineers who died in the 1970 Peru earthquake, the unofficial Jiserska 50 took place on Sunday 12th January. 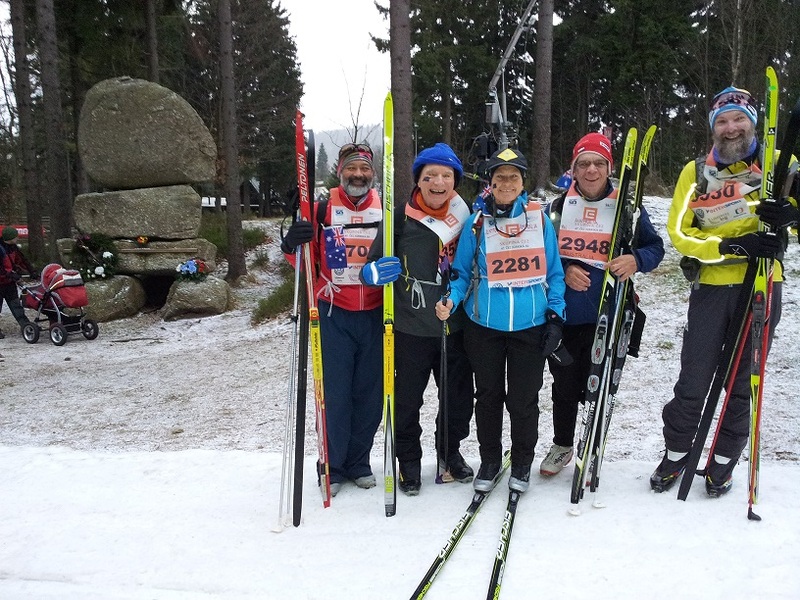 After a short memorial ceremony at the memorial rock cairn near the Bedrichov Stadium in overcast conditions, approximately 1,000 participants mostly wearing their Jiserska 50 race bibs walked, ran, cycled, or skied their way around the Jiserka Mountains. 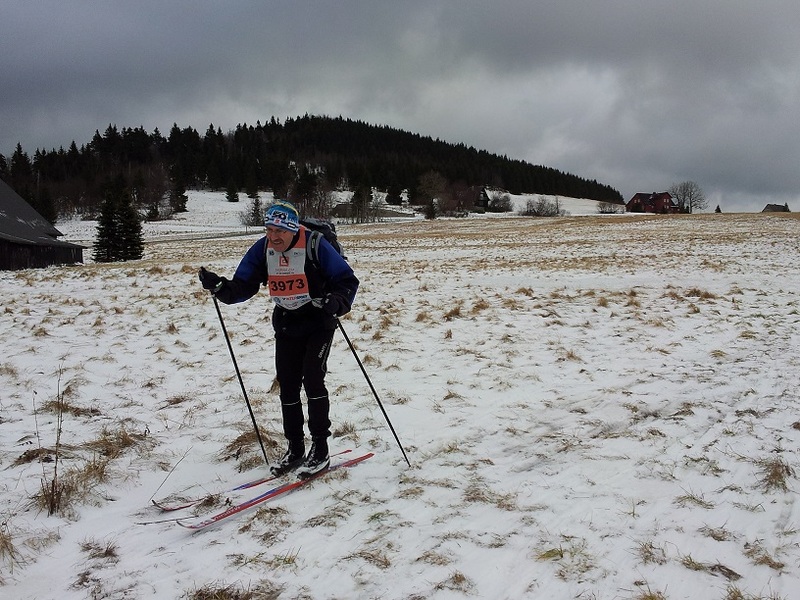 A few hardy souls completed the entire 50km race course which involved skiing with significant walking/running on sections of thin snow/ice/gravel. Most people completed part of the course and just enjoyed being active in the Giant Mountains with family or friends. A couple of Aussies even found some hidden geocaches enroute and enjoyed hot chocolate at the Knapa refreshment hut. Overnight there had been approximately 2cm of fresh dry snow on some parts of the Jiserska 50 course which allowed some magnificent skiing interspersed with sections of boiler plate ice where the snow had blown off and rocky bare parts. Despite the varied conditions an enjoyable day was had by all, with those wanting a challenge being fulfilled. Occasional flurries of sago snow fell during the light breezing overcast day. As an Australian who had travelled from the other side of the world to participate in the Jiserska 50 race one could have been very annoyed missing a Worldloppet race. However even though the race was cancelled our group of 5 Aussies still experienced a superb time visiting the Giant Mountains. We skied most of our 12 day stay in Bedrichov finding enough snow by walking 30 minutes or driving to various parts of the course in a car that our wonderful Czech hosts lent us. We sampled the local cuisine, were shouted a VIP lunch at Jested Tower, attended an ice hockey match with a stadium tour (“go Bili Tygrs”), enjoyed drinks with the “stressed” race director and overall had a great time meeting lots of locals even though we spoke different languages. So even if a race is cancelled you can make the most of the situation and decide to have a good time rather than being upset with missing a stamp. 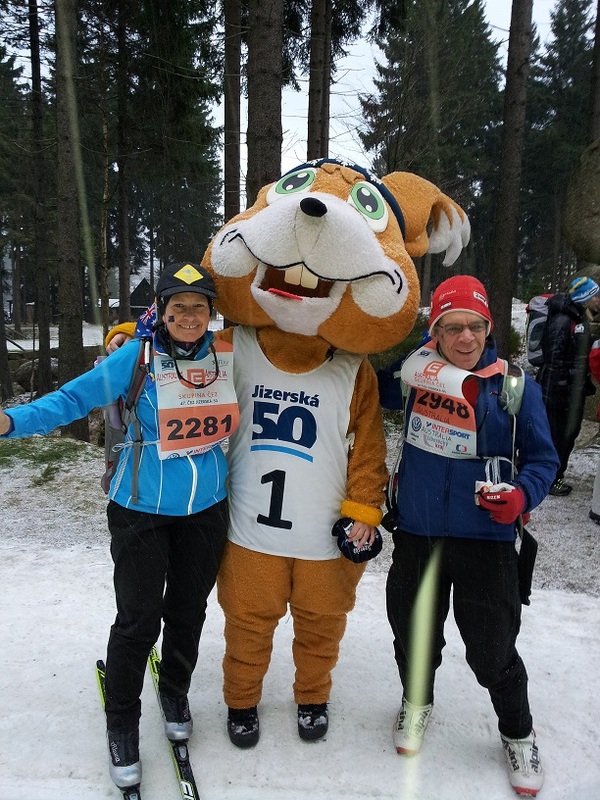 We’ll definitely return again to ski the Jiserska 50 another year.